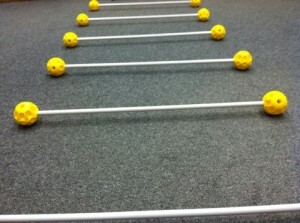 The 1st step was to place a ball on each end of 10 longest rods, ensuring the flatter ends of ball were facing the floor. Next I placed the rods on the floor about 8 inches apart measuring step length with my own short step. The patient transferred to standing from their wheelchair and ambulated forward across each rod turned around and ambulated back to chair and was observed for correct transfer sequencing back to sit. The patient performed this exercise for 3 laps. Next the patient performed proper transferring and them ambulated over the rods with a side step, not turning at end and returning to start position facing the same way. Patient performed this exercises 5 laps. After demonstrating proper transferring patient was asked to ambulate back wards over the rods and was given hand held assist for safety, asked to turn at end and return to chair backwards. Patient performed this exercise 3x. 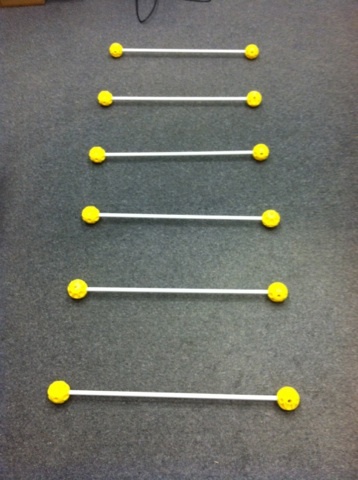 The rods and balls worked very well for this exercise with ball being slightly higher than ground level, forcing patient to increase foot clearance with each step, and forcing equal step length on each LE. I would definitely use the balls and rods to perform this exercise again. 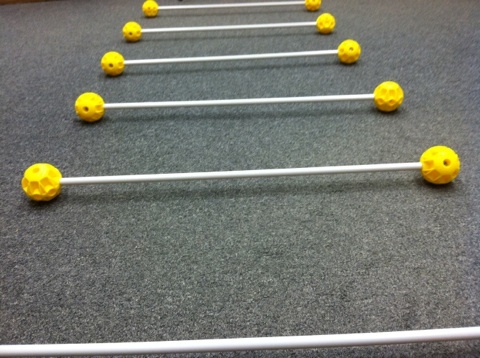 I am going to increase the challenge of this exercise by building hurdles with the rods and balls and adjusting them for step height. 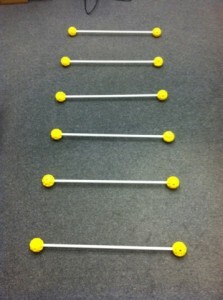 Also able to challenge higher level patients with obstacle courses depending on rod placement and rod height from floor. Excited about doing this.